Hello and welcome to Popsicle week, brought to you by none other than the fabulous Billy Green of Wit and Vinegar! This week Billy has invited the food blogosphere to collectively post its latest and greatest popsicle recipes on the internetz for your benefit. In other words, there’s absolutely no reason why you shouldn’t have a popsicle in your fist by the end of this week. 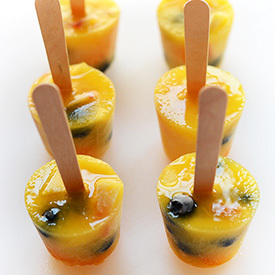 When I was dreaming up my Popsicle recipe I was reminded of the most refreshing frozen fruit experience I’ve ever had. It happened during the peak of summer two years ago. It was hot, everyone was sweating, and my friend had scored a major load of fruit on sale at Sam’s. 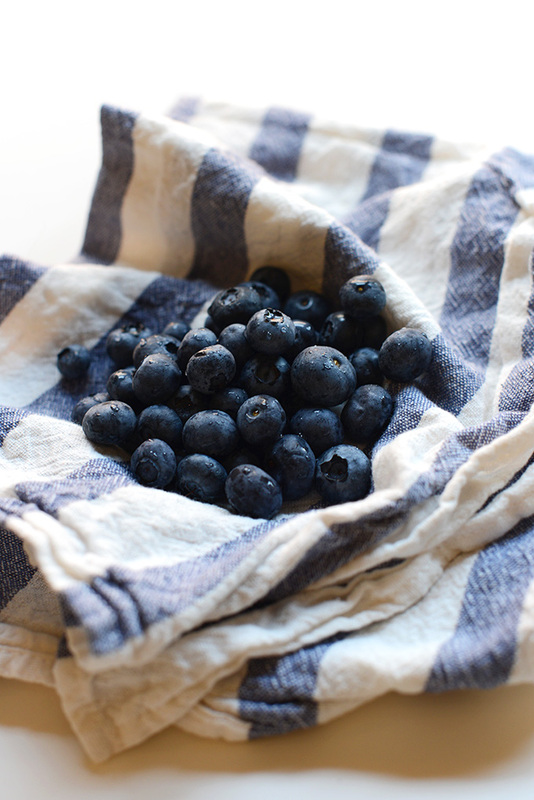 Since you can’t consume 8 pounds of blueberries by yourself in one week – I’ve tried – she decided to freeze the leftovers into little snack baggies and she gifted one to little old me. I know, I have the cutest mom friends ever. 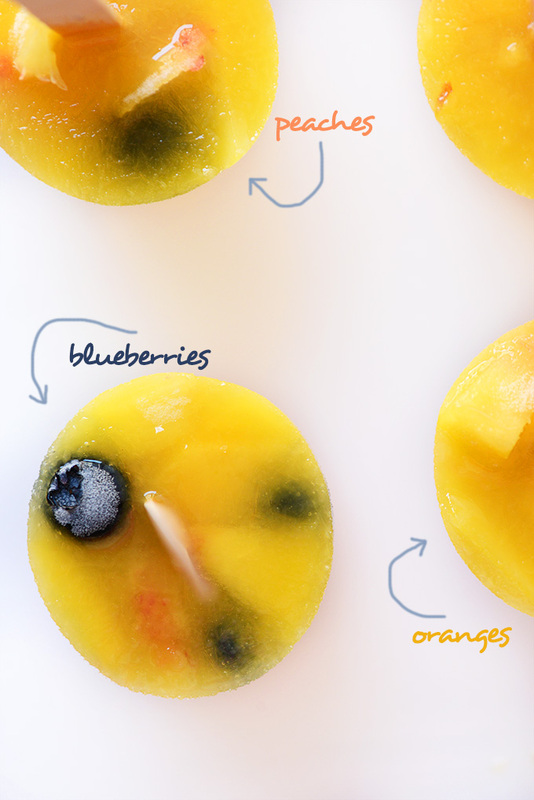 My little frozen fruit baggie beheld mandarin oranges, blueberries and bananas. So good, so simple. I remember the fruit being so refreshing, like a Popsicle, only all natural and totally healthy. I had to have it again. So, this week I crafted my very own all-fruit Popsicles that require just four ingredients and NO Popsicle molds, because I don’t own one and I ain’t buyin’ one. Besides, when you have Dixie cups and wooden sticks, why do you need fancy pants Popsicle molds? To impress your neighbors? DON’T THINK SO. 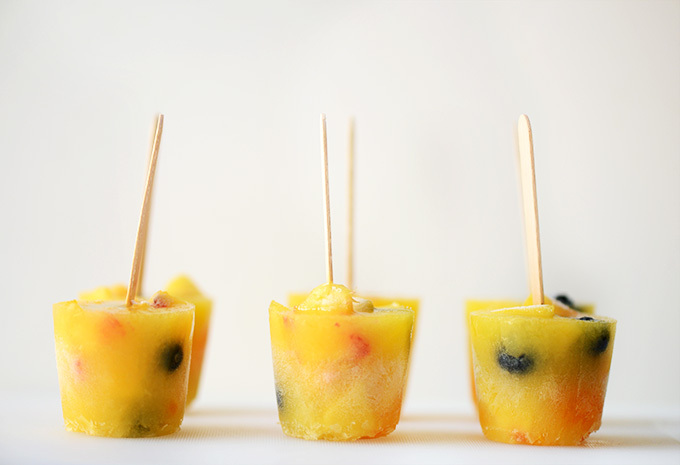 Behold, the all-fruit, 4-ingredient Popsicle. All soaked in orange juice. 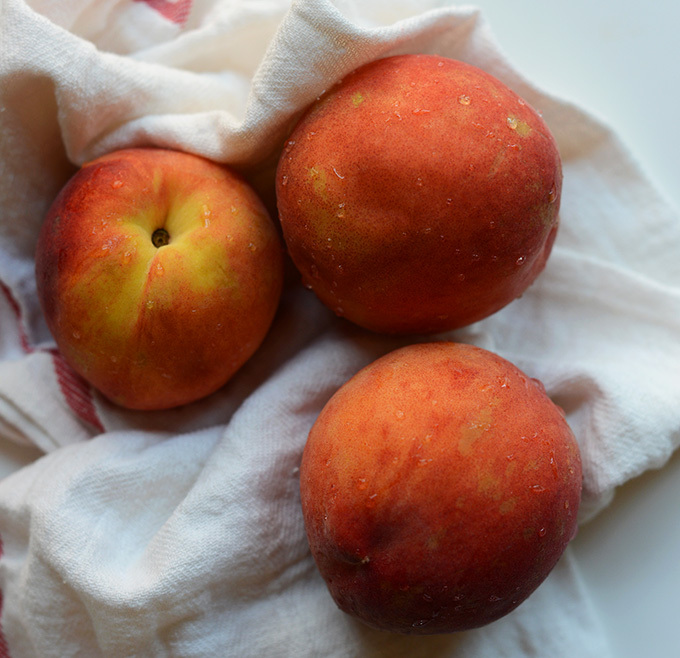 Icy, simple, tart, sweet, soft in spots from the frozen fruit. I’m in Popsicle havana heaven. Wanna join? Hooray! 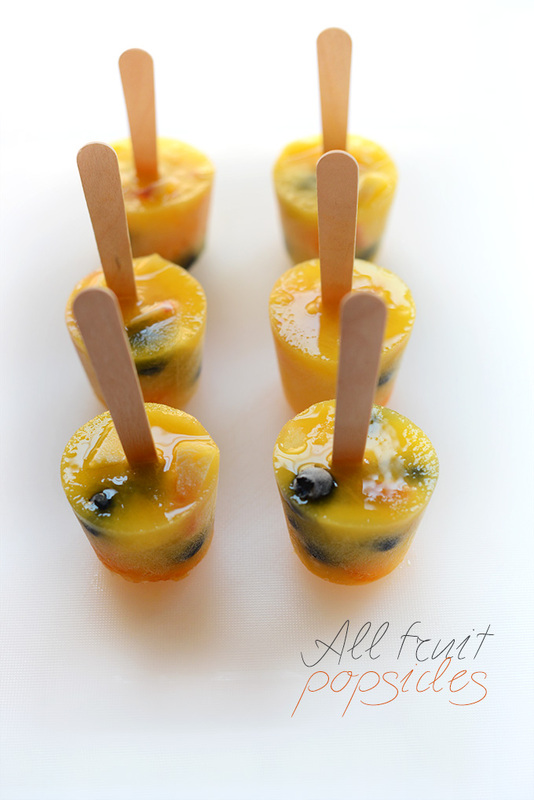 Find this and like 38 other amazing popsicle recipes over at Wit & Vinegar this week! Thanks Billayyyyy. 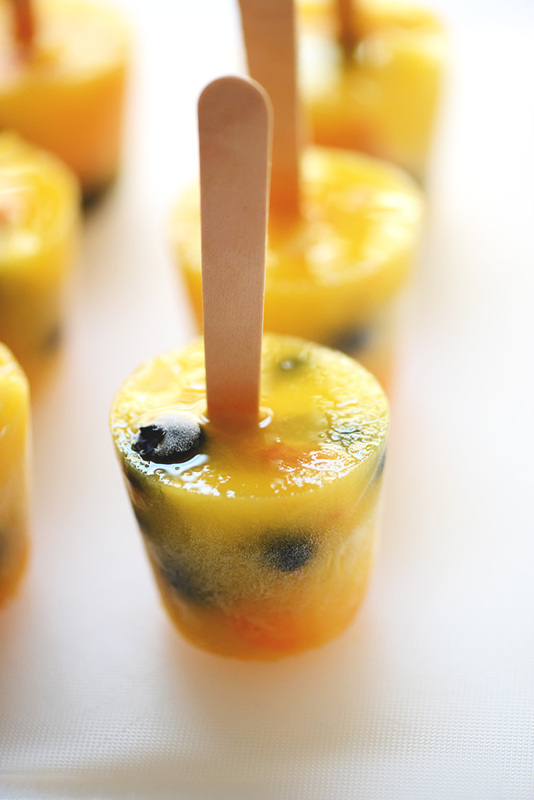 All-fruit Popsicles with blueberries, oranges, and peaches. 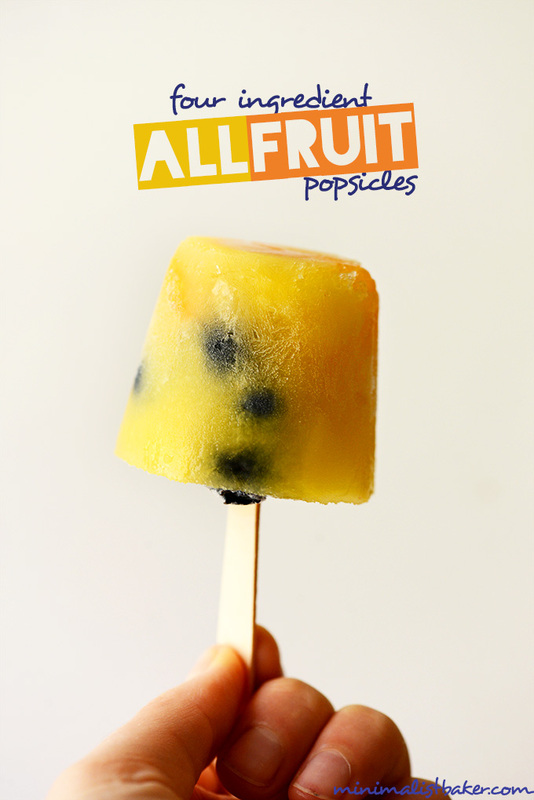 No Popsicle molds required – so simple and so deliciously vegan! 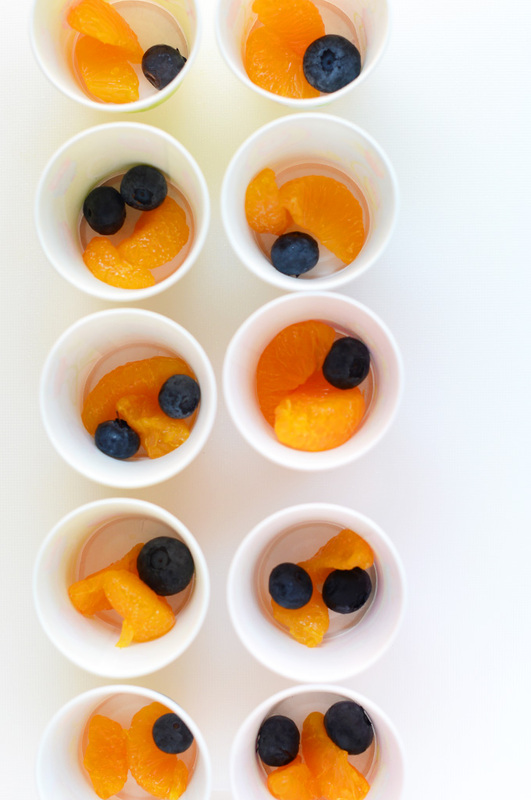 Divide orange segments, blueberries and peaches equally between 7 or 8 dixie cups or 6 standard-sized popsicle molds (amounts as original recipe is written // adjust if altering batch size). Nestle your popsicle sticks down into the bottom center of the molds and top with juice of your choice – I went with OJ, but cranberry or pomegranate would also be great here. Place close together in a loaf pan or other small pan and freeze until set – at least 4 hours. Remove dixie cup molds and consume immediately. Store leftovers in the freezer in a freezer-safe bag. *Prep time does not include freezing time. Kids especially enjoyed the blueberry & orange juice combo, was a hit! love the whole bits of fruit in there…so fun! Wow–so simple and so good! I can’t wait to make these! I love your inspiration for these pops! Such a sweet memory. How refreshing, and gorgeous of course! I love the simplicity and freshness of these! Yum, these look super refreshing! Love the simplicity of the ingredient list too. Must go check out more of this Popsicle Week! 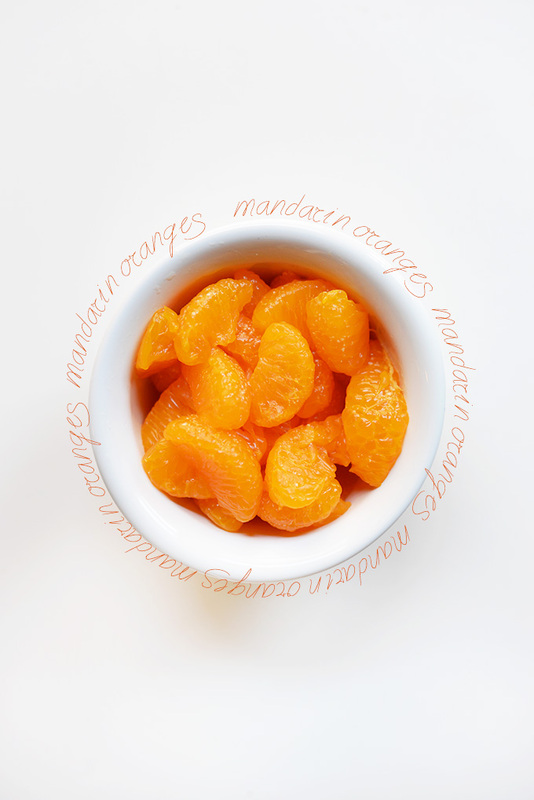 Simple but delicious…these sounds perfect!! I went the dixie cup route too! Plus they are perfectly-sized treats. And also ideal for teething toddlers…my baby would love this, as would I…. Take me to Popsicle havana heaven. With all fruit pops for the win. I definitely hear you on the no mold front–who needs yet another piece of stuff in the kitchen? Or actually twelve little click-together bits of stuff…no thanks. These popsicles, on the other hand, sound excellent! You’ve got to love the simple deliciousness of frozen fruit. Pretty much perfection in a popsicle. Popsicle havana heaven? I want to go to there. 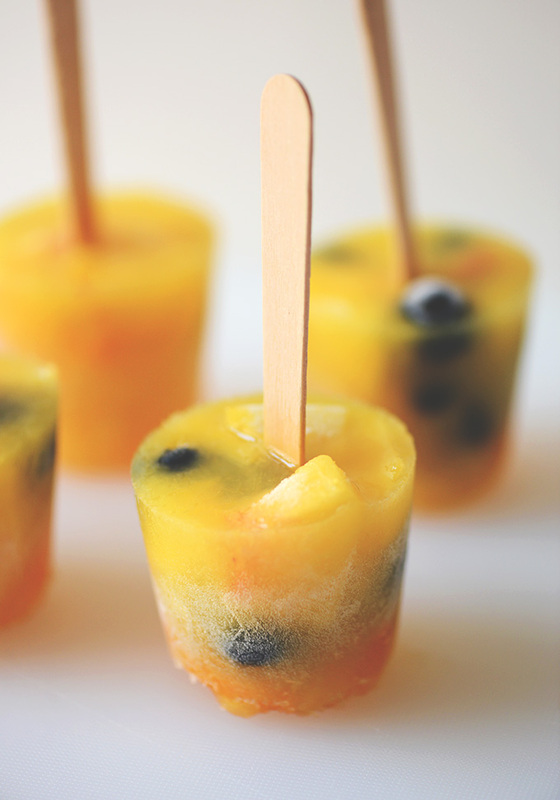 Gimme all the all-fruit pops! These are so beautiful! Wow, gorgeous! All fruit?!? YES! These look awesome and I am so excited for popsicle week! All fruit sounds daaaang good to me! Love, love, love how simple these are. Totally perfect for summer.